Daedric summoning was the only way to interact with the Daedric Princes in TES:II, the game which they were also introduced in. From what we know of the Breton these summonings are very in their character, fitting much better than the organized religion/cult style of the Daedric statues in TES:III and TES:IV. This is why I am suggesting that this element remain a part of High Rock's identity and be enabled as gameplay. This being said, the summoning in TES:II was rather limited. There was only one way to summon; by paying witch covens and mages guild on the EXACT right day on the yearly calendar. This is pretty constraining and doesn't play well with the style of TES:III. This is why expanding the ways summoning can work would be beneficial. Here are the four summoning methods ThomasRuz and I came up with on discord. 1) Pay a witch coven or mages guild on the summoning day of a Daedric Prince to summon them. This would cost ALOT of money but the player would not need the specific items required for the summoning and it will be a 100% success rate. Witch covens may give cheaper prices but will only do it for the Daedra they are associated with. 2) Find a summoning circle/daedric alter and preform a summoning with the right offering items for the Daedra you are trying to summon on their summoning day. This will be effected by the PC's conjuration skill. 3) Find a summoning circle/daedric alter and preform a summoning with the right offering items for the Daedra you are trying to summon after meeting a certain hidden requirement. This may be for example killing 5 innocent people the day of your attempted summon of Melepha or trying while there is a thunderstorm for Sheogorath. There would be characters and books which mention the methods but they would be very hard to find. This would have a higher base success rate than summoning day rituals but it would still be effected by conjuration. 4) Meeting a certain milestone with a NPC who is either a master conjurer or someone who is very devoted to a certain Daedra and asking them to do the summoning. This will be free of every requirement but the specific offerings needed and will have a 100% success rate. Examples of characters who may have this are a Orc priest of Malacath you need to help in Orsinium or a rouge Conjurer who needs to be charmed in a dungeon. 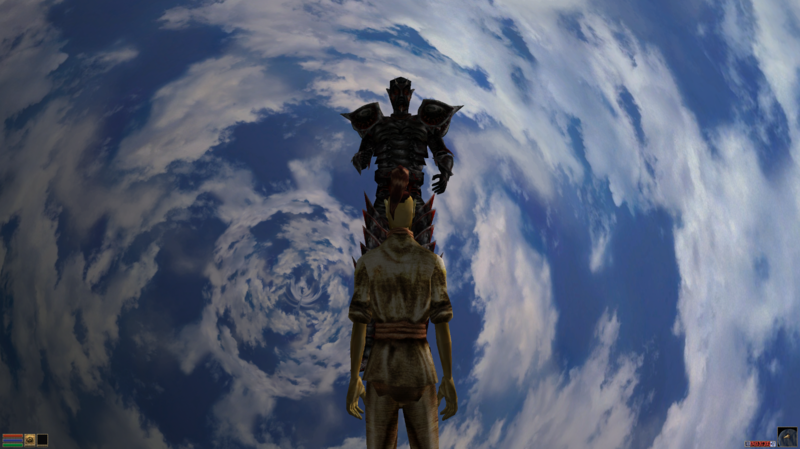 They probably wouldn't do this very often for you or if you have a bad relationship with the Daedra. ThomasRuz mentioned the idea of adding a book to Tamriel Data called “Daedric Summoning: Witch Rites” which would go into detail about what offerings you need and when the dates are. A failed summoning (wrong day, wrong offering, bad skillcheck) will result in the PC being hit with a negative effect. This negative effect will be associated with the Daedra that the player tried to summon; in the case of both the wrong day and the wrong offering it will just be a random effect from one of the Princes. Lastly, there is a 10% chance that Sheogorath would show up instead of the Daedra you were trying to summon in TES:II and I believe this concept should persist in our summoning model. i know that this would be a departure from Daggerfall lore, but I feel like it might be a good idea to expand the number of days a given daedra can be summoned per year. Waiting an entire year for the correct date, missing the appropriate day or just not getting your one chance because there's a thunderstorm are not very fun gameplay, and could lead to immersion-destroying behavior (like waiting an entire year for the next opportunity). You could bump it up to six or even twelve times a year, or tie the day to an irregular event (like thunderstorms for Sheogorath). Changes like these could be explained as "recent advances in the art of summoning", advanced numerological or astrological calculations, or legalistic loopholes like using a different calendar or tradition. I was thinking that the REAL way to do it would be the hidden method or finding a Daedric associated individual to do it. Both methods would allow the player to do it on ANY day and would also be a reward to the player for finding out more about the Daedra by helping its mortal followers or raiding witch covens for secrets. I understand what you are saying though, maybe we can increase the number to 4 evenly spread throughout the year. I think any more would diminish the importance of the whole affair and make the any day methods less special/useful. Four days might be best. The thing I fear is that, when giving the player the option to summon the daedra at any time, the summoning days will become completely superfluous: when given the option to simply wait for something or do a fun quest to attain it, most people will choose the quest (and they'd be right to). So a priest of Archei would both be knowledgeable about Aedra/Daedra interaction, and more normal ceremonies? Asylum made some basic objects to work with, a sphere of vortex/spinning clouds which I used to do some testing for how the Daedric Pocket realm might work in game. I made an interior cell where I made an invisible box out of an edited version of 'EditorMarker_box_02' and then placed the sphere around the box so that the player appears to be suspended. Here are some of the screenshots and a gif. Here I will lay out a basic plan for what the ideal pocket realm would look like. Ideally the object would not be a sphere but instead would be a long two ended funnel, where each end would appear to have much more depth than it actually does. With a vortex/spinning animation, these ends would be the focal point of the animation and the pocket realm. 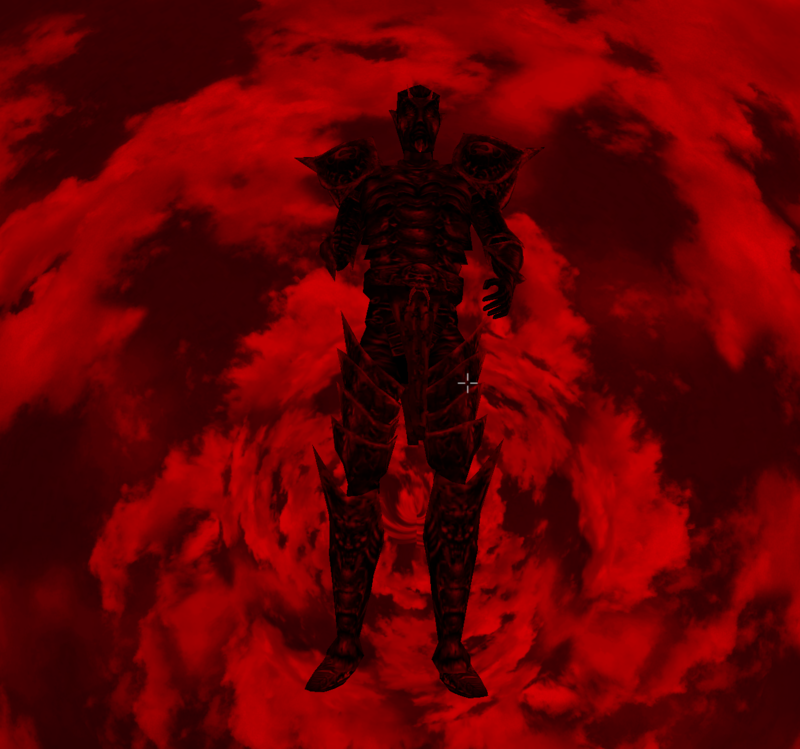 At one end will stand the Daedric Prince, suspended like the player but out of reach behind an invisible wall. If done correctly, the effect shouldnt feel that much like an invisible wall and more like the player making no progress towards either end in this void (this effect is already somewhat true in my test). The Prince should have a presence over the Realm and should feel overpowering and commanding. The focal point where the vortex meets will be directly behind them. On there other side will be the end point of the vortex, maybe a design which implies it is where you came from and an escape root back to Tamriel. The design of the vortex should Ideally be star based, a dark background texture with energy and stars flowing over it in a partern that DOES NOT cause motionsickness but rather memorizes and fills you with a sense of other worldliness. Here is a gif of TESII's design for the summoning effect which can act as a main inspiration for the design. Mechanically this zone should be very simple. Either it can be copied over 16 times or a single realm can act as the meeting place for all the Daedra since through scripts. The first option may be less of a headache and may leave room to make small changes to the design and sound of each pocket realm to customize it for each of the Princes. When a player successfully summons a Prince, they are automatically transported to the cell. After a short pause so the player can center themselves and awe at the situation (4 seconds? ), the Daedra will initiate a dialogue box. If HR were to have voiced lines, this would be the time in my opinion but that is a discussion for another time and is largely optional extra fluff. The dialogue will be discussed in each of the quest posts in the Daedra quest thread but in general each will discuss the situation and ask whether you want to take their quest. Answering no for many Princes will cause them to summon in servants to attack you, so the realm needs to be large enough and built for a combat between the player and multiple minions. When or why the combat occurs for each individual Daedra can be up to the quest dev but in general the idea is the Pocket Realm should be able to support this action. Once the player either accepts the offer or finishes off the goons, they will be teleported back out of the Pocket Realm (if the first teleport is able to log where the player was and then send them back, super, otherwise having it teleport you back to some particular spot isn't a big deal). I linked the esp I made for testing below as well as the .nif. Place the .nif directly into the /Data Files/Meshes so that the custom object can find it.